To succeed in today’s interconnected and complex world, workers need to be able to think systemically, creatively, and critically. Equipping K-16 students with these twenty-first-century competencies requires new thinking not only about what should be taught in school but also about how to develop valid assessments to measure and support these competencies. 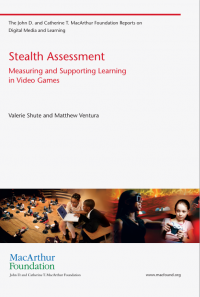 In Stealth Assessment, Valerie Shute and Matthew Ventura investigate an approach that embeds performance-based assessments in digital games. They argue that using well-designed games as vehicles to assess and support learning will help combat students’ growing disengagement from school, provide dynamic and ongoing measures of learning processes and outcomes, and offer students opportunities to apply such complex competencies as creativity, problem solving, persistence, and collaboration. Embedding assessments within games provides a way to monitor players’ progress toward targeted competencies and to use that information to support learning. Shute and Ventura discuss problems with such traditional assessment methods as multiple-choice questions, review evidence relating to digital games and learning, and illustrate the stealth-assessment approach with a set of assessments they are developing and embedding in the digital game Newton’s Playground. These stealth assessments are intended to measure levels of creativity, persistence, and conceptual understanding of Newtonian physics during game play. Finally, they consider future research directions related to stealth assessment in education.